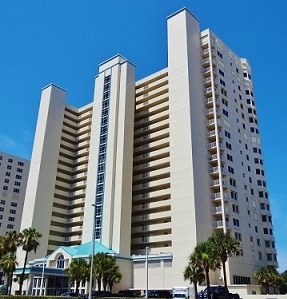 The Grand coquina condo is located on the "drive" beach Daytona Beach Shores and offers some of the best ocean and river views! Towering 23 stories with 112 units really makes this complex a stand out on Atlantic Ave. Whether you are searching for a vacation home, rental property or a primary residence, Grand Coquina will appeal to all condo buyers. Bring your pets! 2 pets up to 30 lbs is allowed. A 2 week minimum rental is required by the association which is great for rental income potential.